Watching fireworks is an annual tradition for many celebrating our country’s Independence Day. Bladen County is no different during the patriotic holiday. 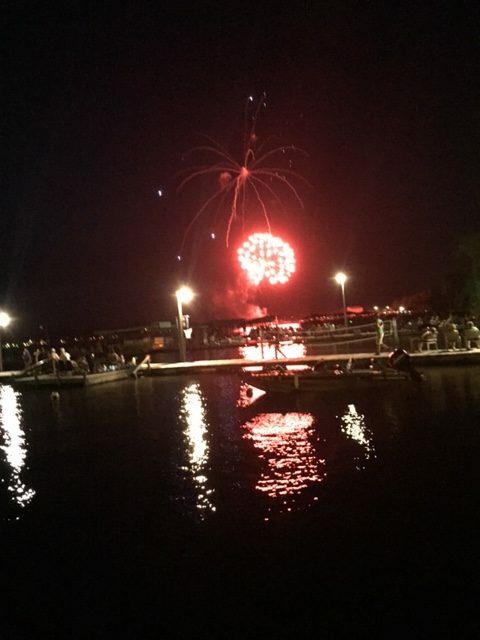 Dawn Maynard, Executive Director of the Elizabethtown-White Lake Area Chamber of Commerce confirmed there will be more fireworks this year at the annual Fourth of July Fireworks show. 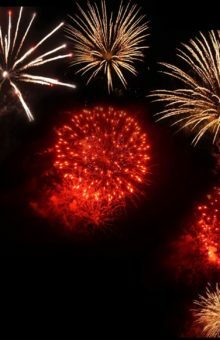 There was an extra 1,000 dollars spent, making the total investment around 10,000 dollars in fireworks for this year’s show at the lake according to Maynard. 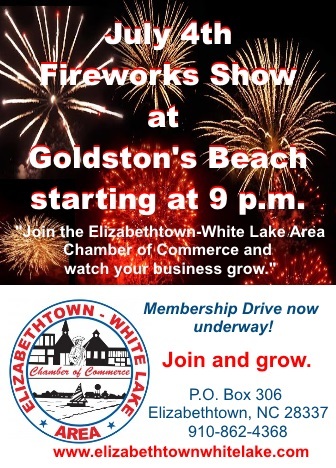 The event is planned for Wednesday evening, July 4th, around 9 p.m. at Goldston’s Beach at White Lake. The annual fireworks show is sponsored by the Elizabethtown-White Lake Area Chamber of Commerce. “We invite people to bring a lawn chair and their families, and enjoy the rides and stay for the fireworks,” Maynard announced. She added the annual event offers a fun time for the entire family. Maynard said Goldston’s Sandwich Shop will be open as well as Goldston’s Restaurant. The arcade offers amusement rides and plenty of fun games for everyone. You can also try your hand on the miniature golf course. As dusk approaches, the fireworks will begin near the Goldston’s Beach Pier. Maynard said there is overflow parking available across the street from Goldston’s Beach. Don’t forget the annual Fourth of July Sidewalk Sale taking place in Elizabethtown. “I can’t believe we will be on the back half of the season after this week,” Maynard said. The fun will not be over though. The Sunset Jams concert series will continue at White Lake on Thursday, July 19th, with The Big Time Party Band and on Thursday, August 16th, The Fantastic Shakers will perform. 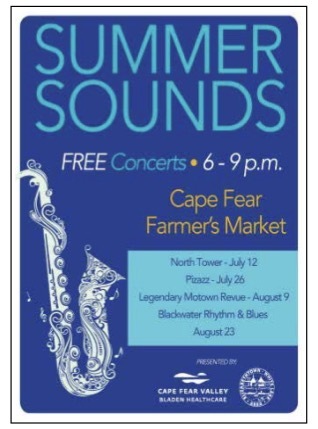 July will also kick off the Summer Sounds Concerts at the Cape Fear Farmer’s Market in Elizabethtown. The line up is as follows: July 12, North Tower, July 26 Pizazz, August 9 Legendary Motown Revue and last but not least, the concerts will end on August 23 with Black Water Rhythm & Blues.